At Al Burhan Airways we are constantly striving to add new and exciting chapters to it, we are always looking for bright and talented people to join our Team. We believe that a dynamic and diligent employee is the key to our success. When you join Al Burhan Airways, you become part of a diverse global family that values respect, integrity, and inclusion, while at the same time investing in your individual professional development. Through our talent management initiatives, we work with you to ensure there is opportunity for jobs to turn into careers. Our commitment to continuous improvement fosters lean and efficient operations. 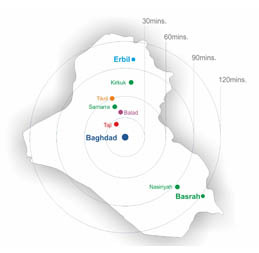 Our mission is to ‘work towards a better Iraq’ and to continuously reinforce a safe working and operational environment with strong communication. If you think that a Job with Al Burhan Airways is right for you please download our simple PDF available in English and Arabic and send back to Info@alburhanairways.com. We look forward to hearing from you.